Onyx, quartzite, marble, granite, etc. are used as artwork because they have unique structures and textures, which can create additional patterns and functions that not only attract attention, but also create a feature in their featured applications. Their translucent properties allow light to pass them through. These natural materials are very beautiful on their own characteristics, however, it becomes surprisingly eye-catching when backlight. Illumination brings out features that are not visible without illumination, such as depth and color. Their colors may look warmer and more vibrant. A suitable backlight allows the stones to be illuminated, highlighting every aspect and detail, enhancing its natural wonders as a beautiful piece of art. In addition, advances in lighting technology are another reason why backlight is becoming more popular. Conventional fluorescent tubes require a diffusing device, and they havea short life and require continuous maintenance. The invention of LED panels solves these problems. LED panels can fully illuminate the work surface,baffle or other covering materials without a large amount of space after surface mounting, and the lighting performance is stable, basically no post-maintenance is required. When choosing a backlight, we’d better consider their characteristics and our needs.Currently available choices in light are LED temperature (ranging from 2700K to 6000K) and RGB LED,they offer millions of different color options. When choosing the light for the backlight, we should understand the overall impact of the entire space. For example,onyx performs best under soft white light. If the light source is too powerful, it can make the texture indistinguishable from the rest of the stone, and the light source is too weak to reduce the brightness. In addition, when using these natural stone as the backlight objective, the thickness factor should be considered, because its excessive reduction can be determined, especially in the case of backlight. The visual effect is flattened, which will deprive the material of the depth. For example, if you want to create a very warm color temperature, you should use a honey-colored rough stone that will help bring more yellow color to the stone. The backlight stone is usually horizontally as a countertop , but can also be placed suspended vertically. It can be used for flooring, wall coverings, decorative furniture, fireplaces, bathrooms, kitchen counter-tops, tailgates, bar counter-tops, vanity tops, tables, murals, room dividers, etc. For example, at the bar front desk, agate chose a special stone as the focal point of this hotel bar area, which requires books matching in order to create a continuous vein pattern in the corner area of the bar. 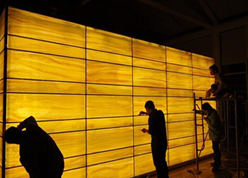 Moreover, in the hotel lobby, in front of the glass entrance, the honey agate is laminated with the laminated glass and covered on the entire LED Light Panel for maximum lumen output, creating a luxurious look. And in a large club office, a conference table is made with backlit stone, and there are more traditional lighting options in the center. The nightclub has this watch in its administrative office for owners and administrators to enjoy. The fascinating colors of these natural stones are permanent and they do not fade over time.As the light passes through the backlight, their natural features dance from the surface and play with the surface. Depending on the texture of the particular board, the result can be warm and enticing, or dramatic and bold. Whether it's at home, in the office, in a restaurant or at a bar, use an on-board, and when it's properly backlit, it will let its natural features shine. For the led light panel backlight stone onyx, marble, quartzite, contact with us.